Where is mini Holland happening? “Villagisation” is planned for all 3 areas around Walthamstow Central: between Hoe Street and Wood Street (which includes Walthamstow Village), Blackhorse Village between Hoe Street and Blackhorse Road, and Markhouse Village between Hoe Street and Markhouse Road. The ‘Cycle Super Highway’ will run along Lea Bridge Rd from Whipps Cross roundabout (which will be changed to a signalled junction) across to the Hackney borough border at the River Lee Navigation. 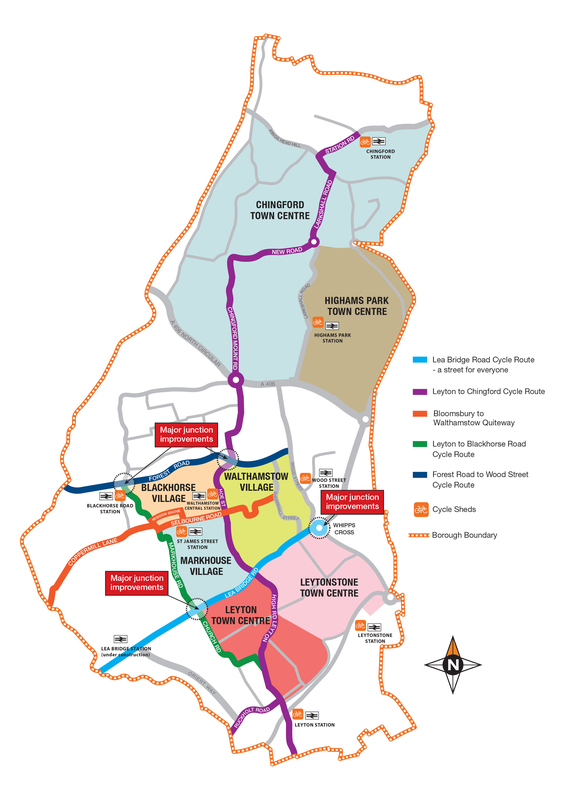 The secondary town centres which will see a range improvements for pedestrians and cyclists are Chingford, Highams Park, Leyton & Leytonstone, and there will be 2 new high quality cycle links from Chingford to Leyton, and from Blackhorse Road to Leyton. The cycle parking hubs will be at the following stations: Walthamstow Central, St James St, Blackhorse Road, Leyton, Leytonstone, Wood Street, Chingford, Highams Park. Residential parking hangers will be located according to resident demand. Further afield, there are also Mini Holland schemes in the neighbouring borough of Enfield, and in Kingston.